"After breaking his leg photographing a racetrack accident, a professional photographer, the adventurous L. B. 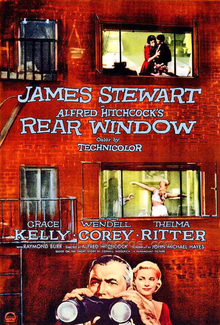 "Jeff" Jefferies (James Stewart), is confined to a wheelchair in his Greenwich Village apartment to recuperate. 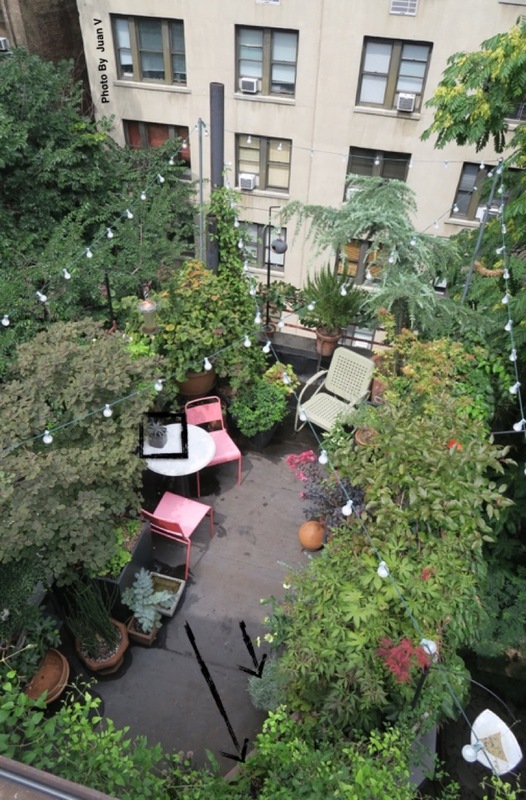 His rear window looks out onto a courtyard and several other apartments. 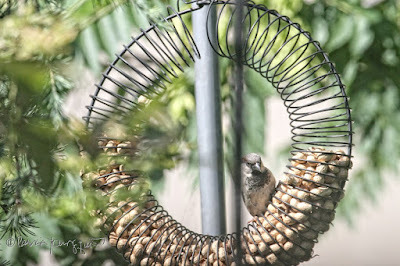 During a powerful heat wave, he watches his neighbors, who keep their windows open to stay cool." Like Jefferie, my NYC apartment (with a garden atop a rooftop terrace, something which Jefferies did not have), my rear window, looks into other apartments, as evidenced in the photo below. The image was taken by Juan V this past Tuesday when he was here to plant some Toad Lilies, pot my Angusitifolum curry, and to help me keep a drainage problem from getting worse. 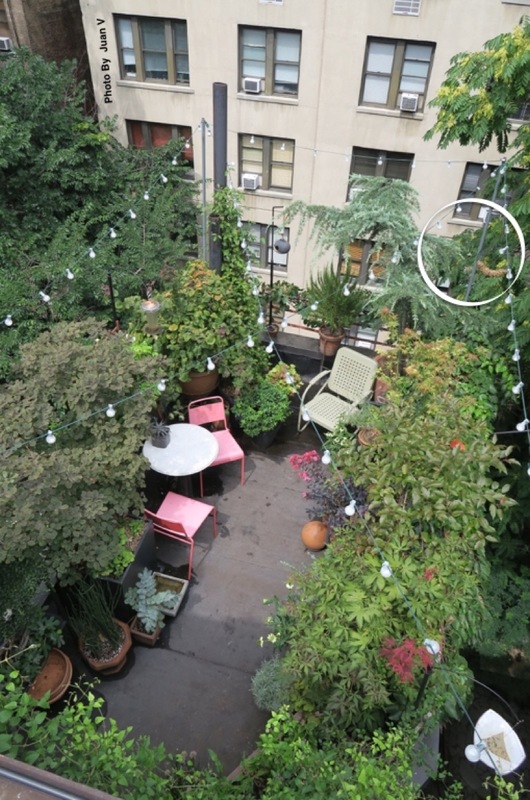 My Toad Lilies are indicated by the larger of the two arrows affixed to Juan's image. 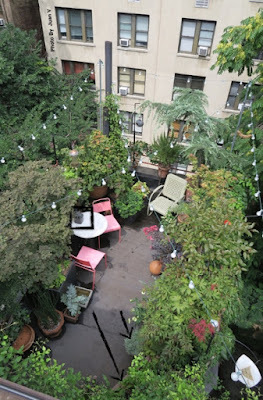 The vantage point of the image, because it was taken from overhead only gives one a sense of where these plants are located within my garden. 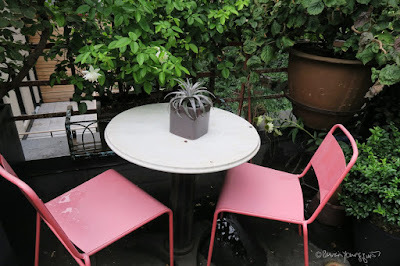 However, I have published an entry here on Blogger that features these beautiful plants; and if you'd like to reference, dear reader, please click here. 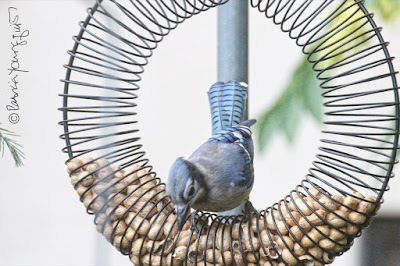 The smaller arrow is referencing my Angusitifolum curry, which I will write about in the coming days. And the square is highlighting a new centerpiece that's been added to my place. It can be seen in close-up format below. 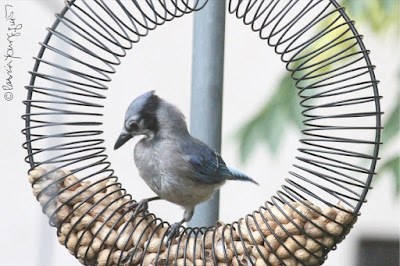 I am likely to include in a separate blog entry, but the center-piece's photo is here now for purposes of reader known as Sara, for she was instrumental in my having it, and I'd like her to see it, as she lives too far away to travel here. And with that info, I've digressed enough, for I was speaking about my rear window view being much like Jefferies' except for the garden. The Rear Window character of Jefferie is on my mind today as I have been somewhat confined to my home with a foot injury. I'm not confined to a wheelchair as he was, but I am much more limited in going about my usual routine. The reason for this being that I have to wear a boot cast which makes it difficult to go up and down the seventy stairs that lead to my place. 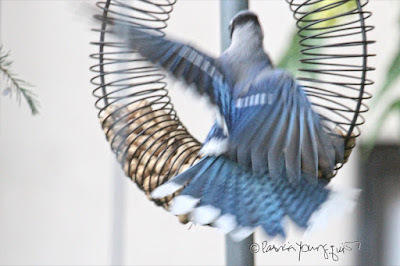 Going up is actually much better than down in terms of my agility when wearing this cast. 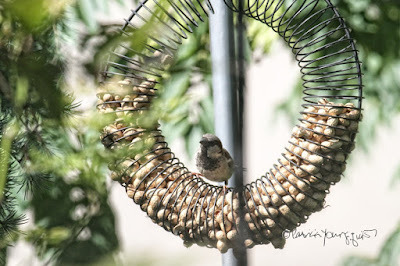 Therefore, I've been attentive to what's going out from the vantage point of my rear window, and have been most fascinated by my view of the array of birds who visit here (as always), especially in relation to "their" wreath-shaped bird feeder that holds the unshelled peanuts that they enjoy eating. In the following picture, the feeder I'm referring to is indicated with a circle. 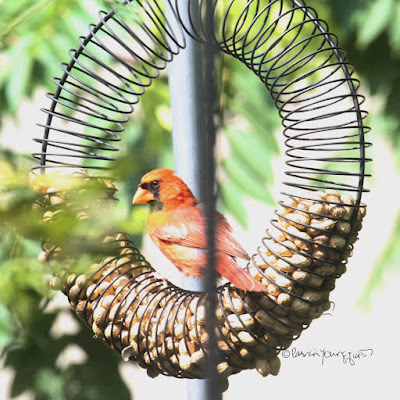 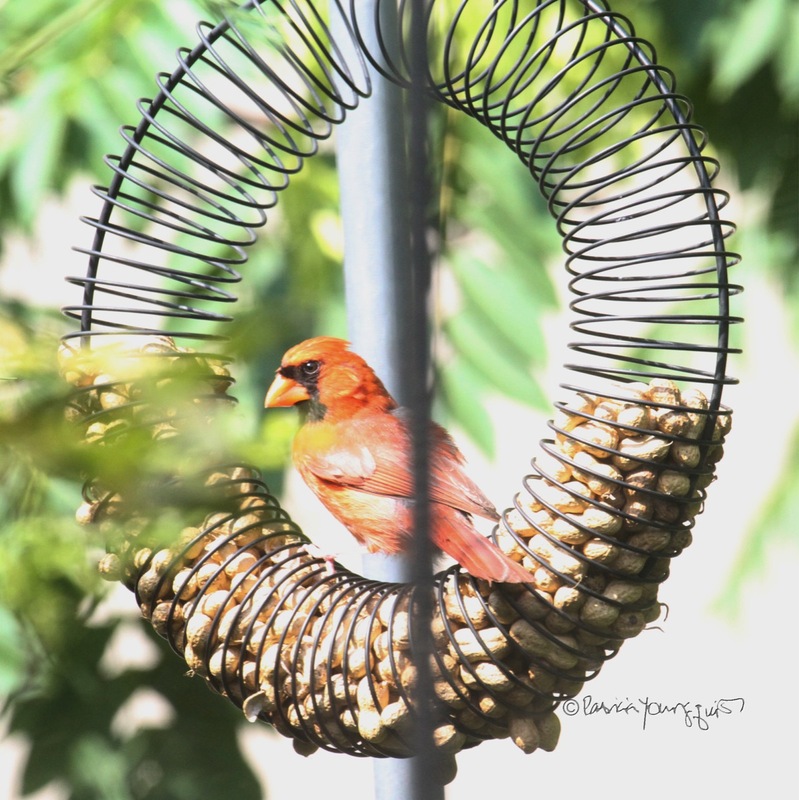 In any event, A couple of weeks ago (July 25th), I wrote about a Northern cardinal availing himself of whole peanuts from this feeder. 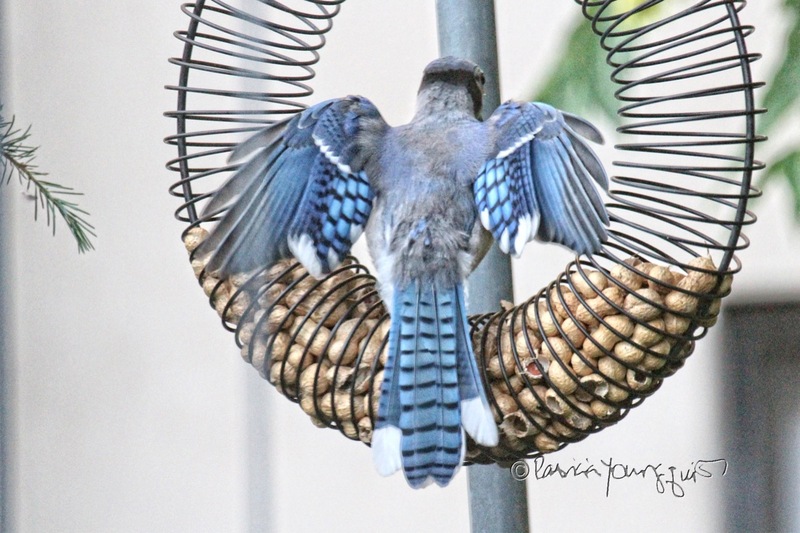 He can be seeing doing this in the next set of pictures. If you'd like to read about this cardinal's antics and see different images, please click here. 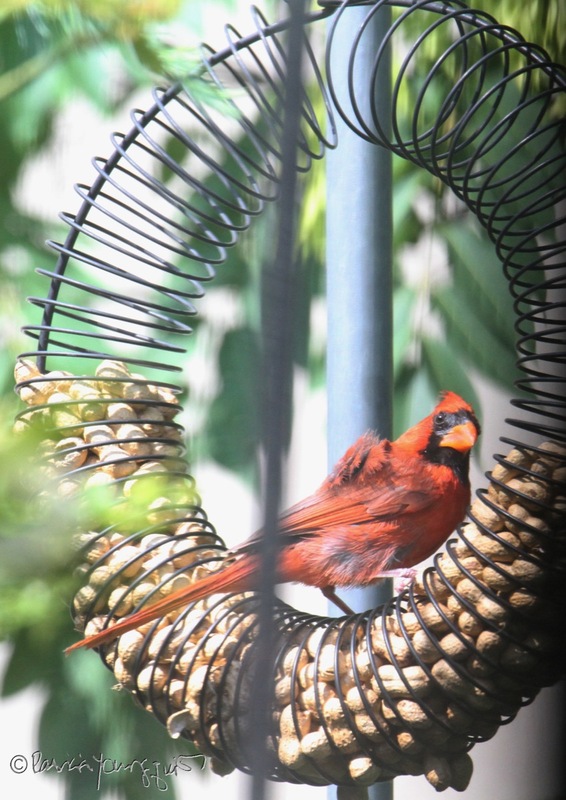 The beaks of a cardinal are designed for un-shelling nuts and seeds which is one topic that is discussed in the book, Words In Our Beak Volume One. 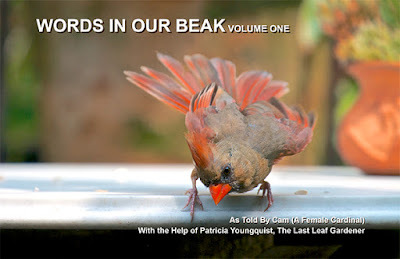 The soft-cover version of this book is available on MagCloud and it's written in the voice of the female cardinal whose picture is featured on the cover, as evidenced below. 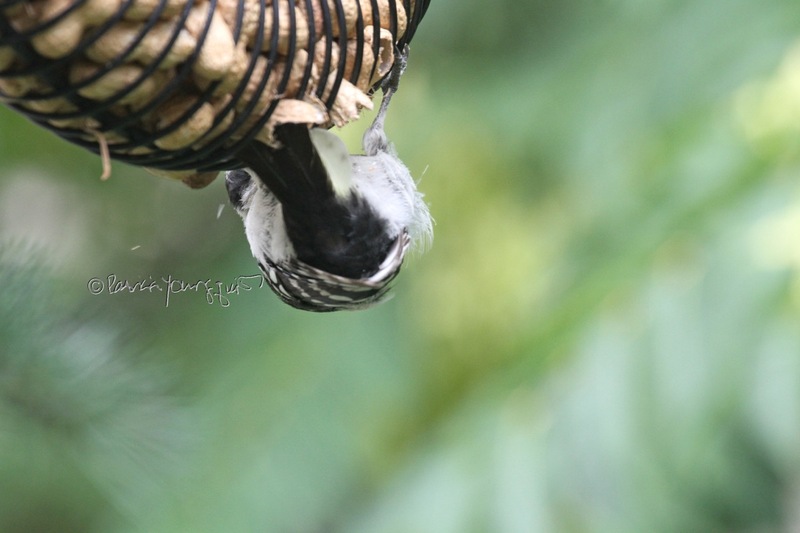 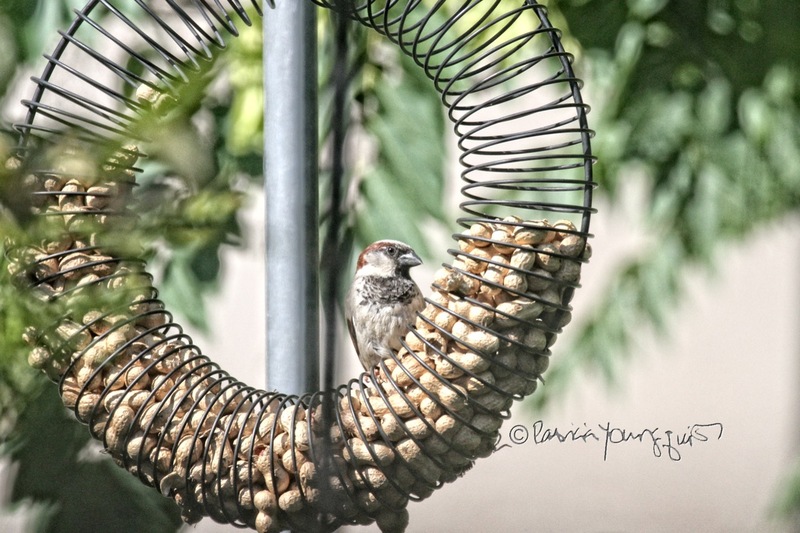 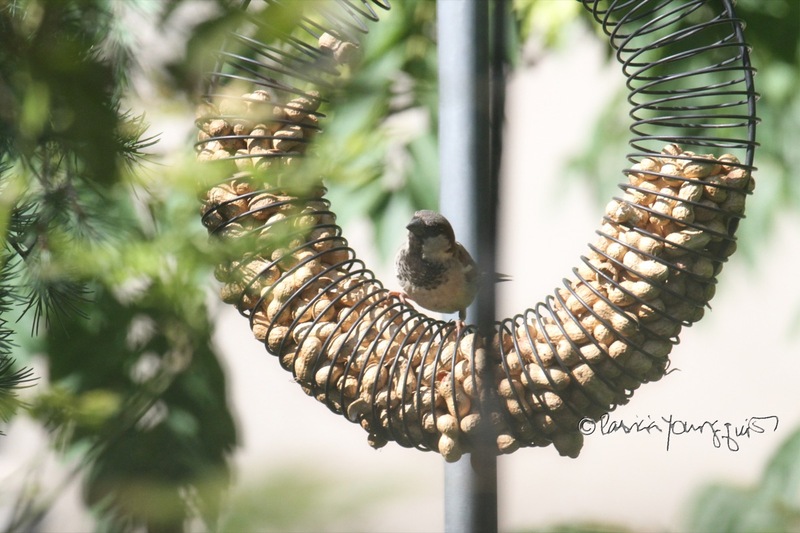 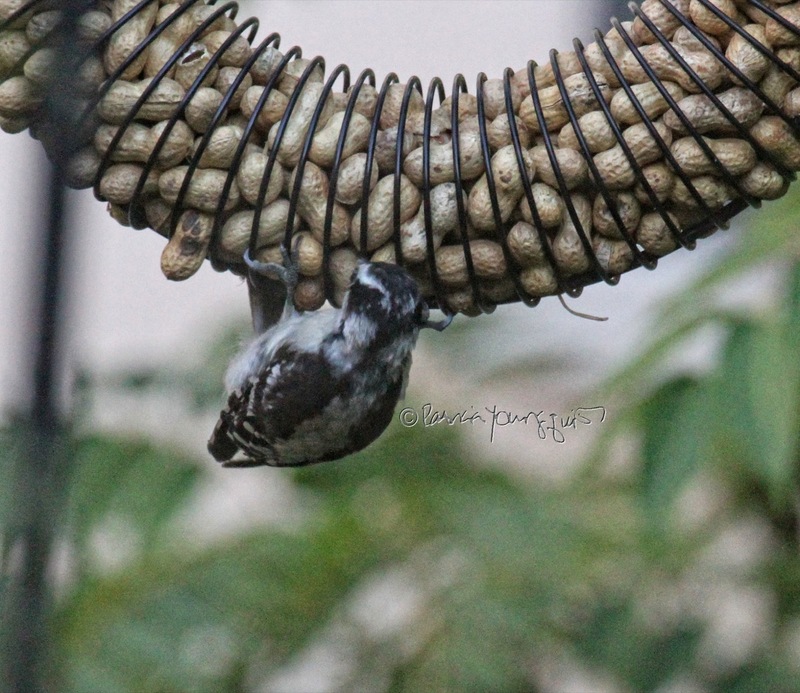 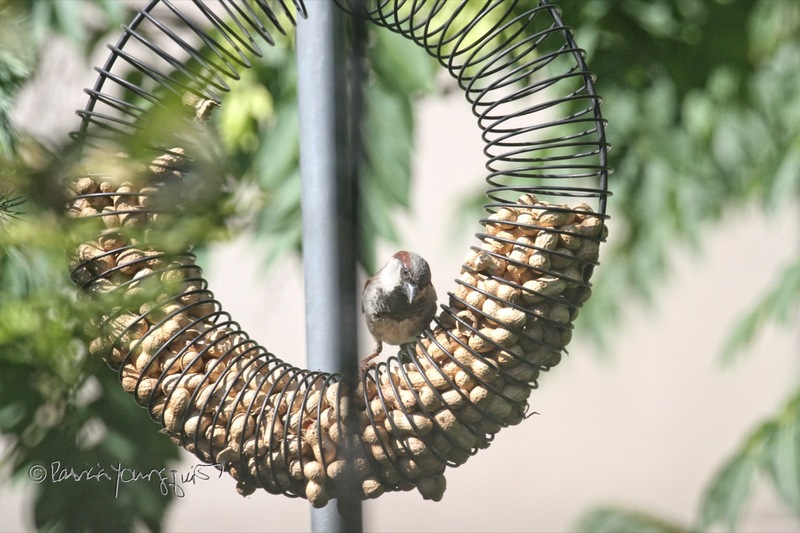 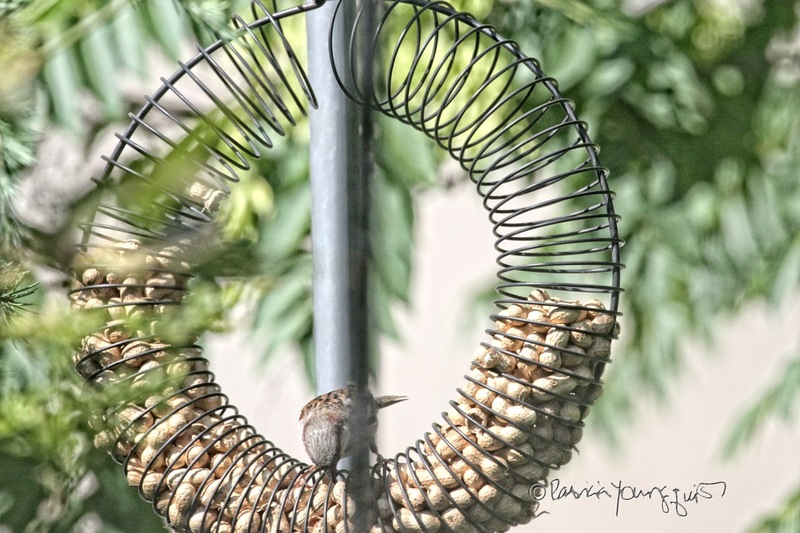 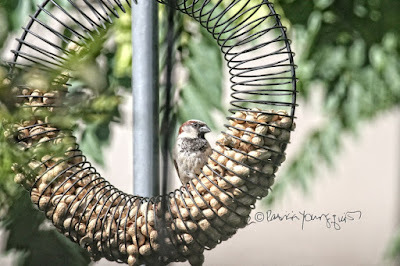 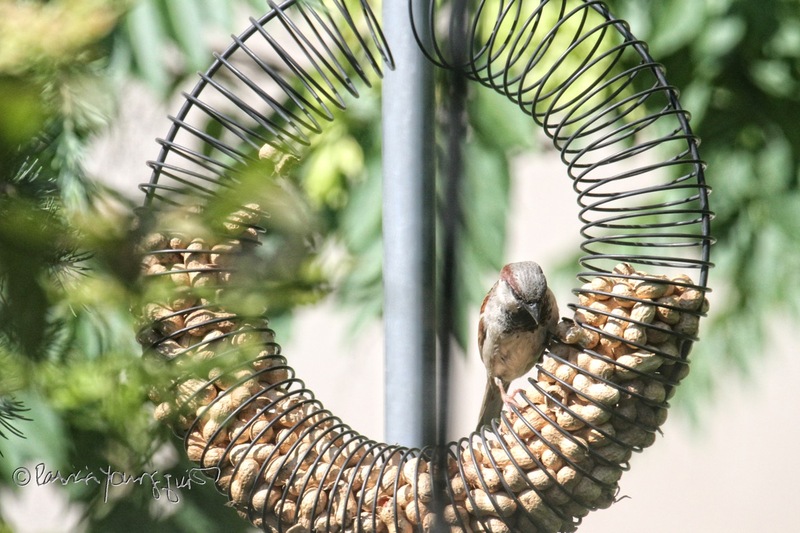 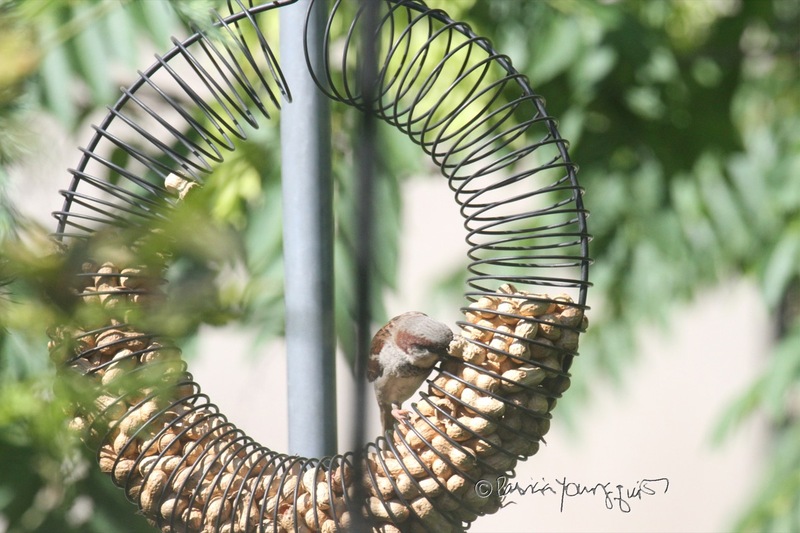 But getting back to my wreath-style bird feeder and the birds who dine from it, sparrows are a bird variety that take pleasure there too, but the task of them eating an unshelled peanut is difficult as their beaks are not designed to open shells! 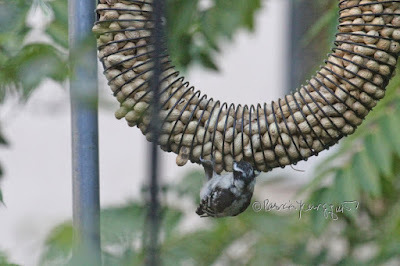 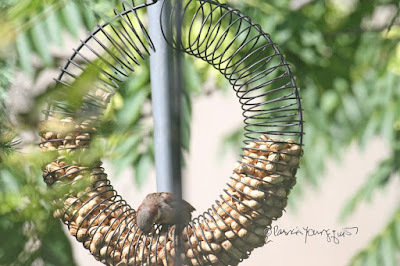 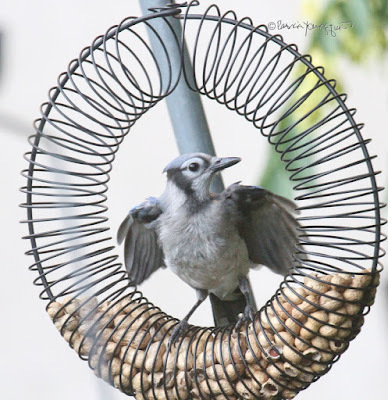 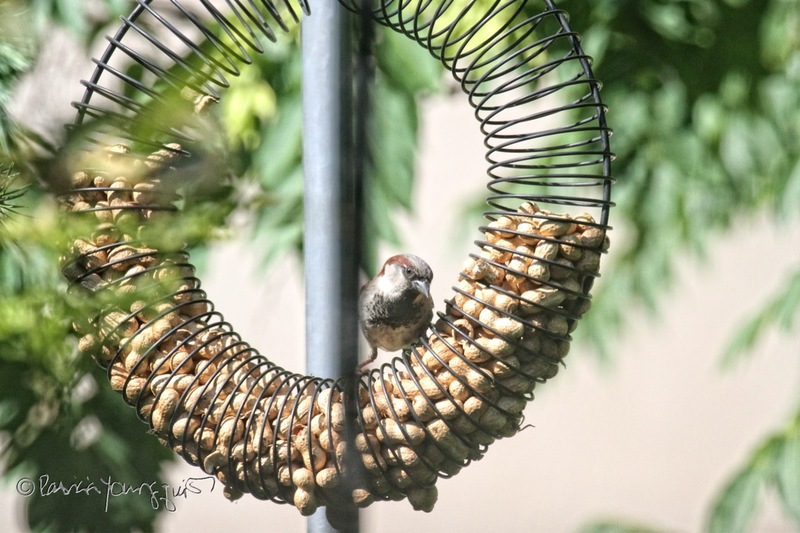 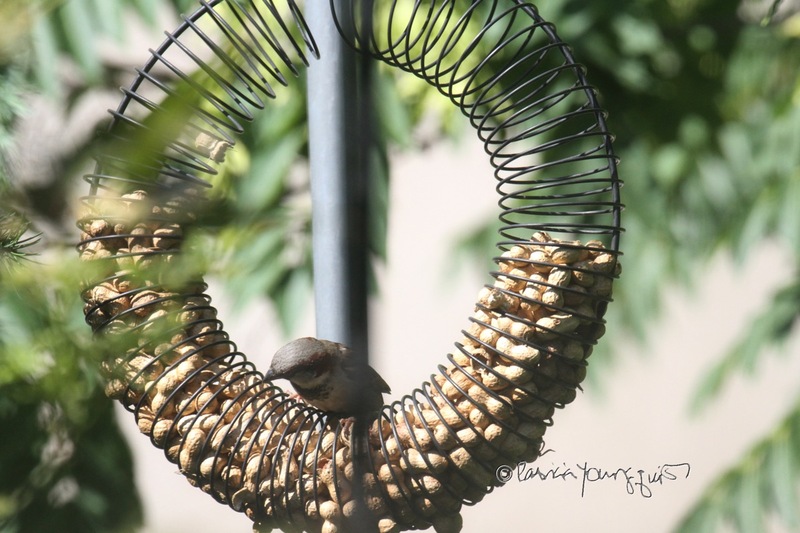 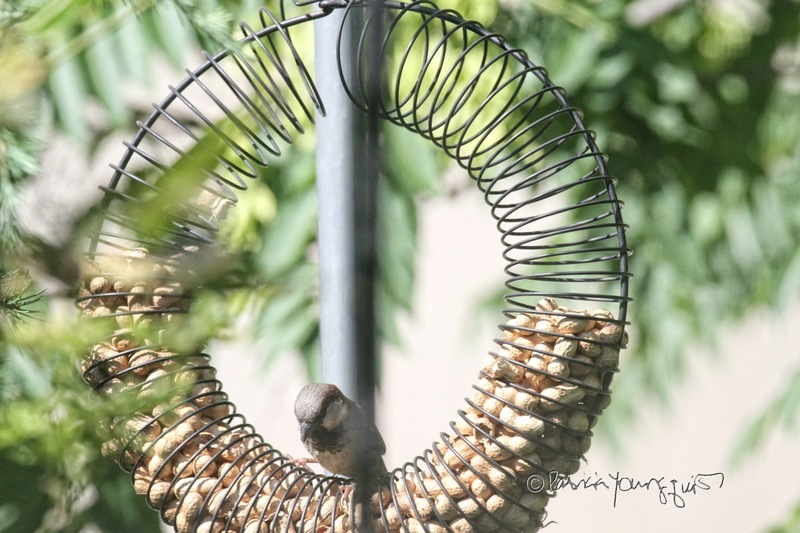 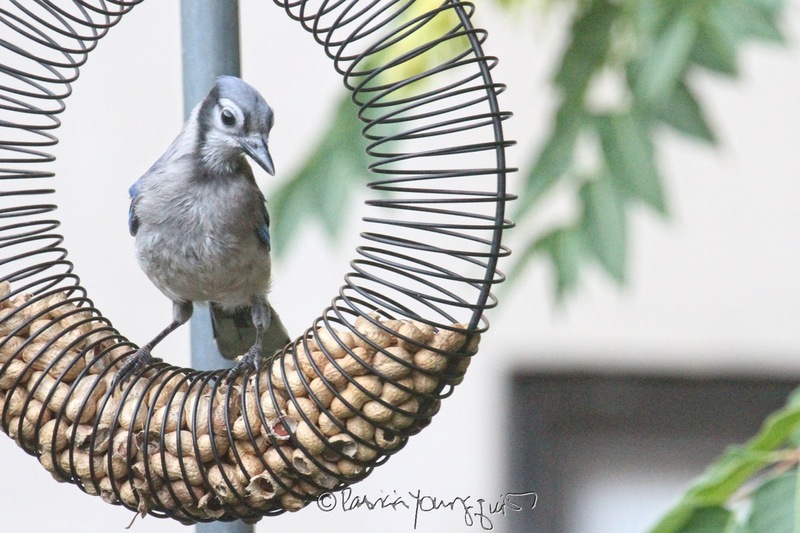 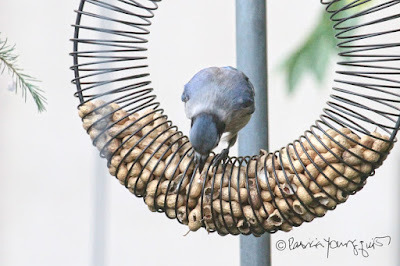 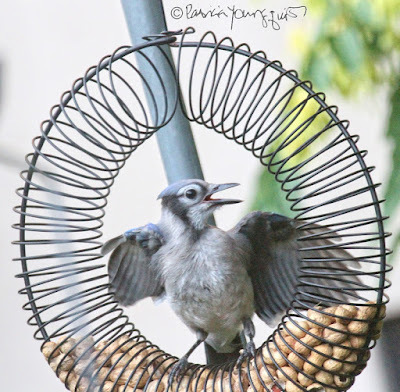 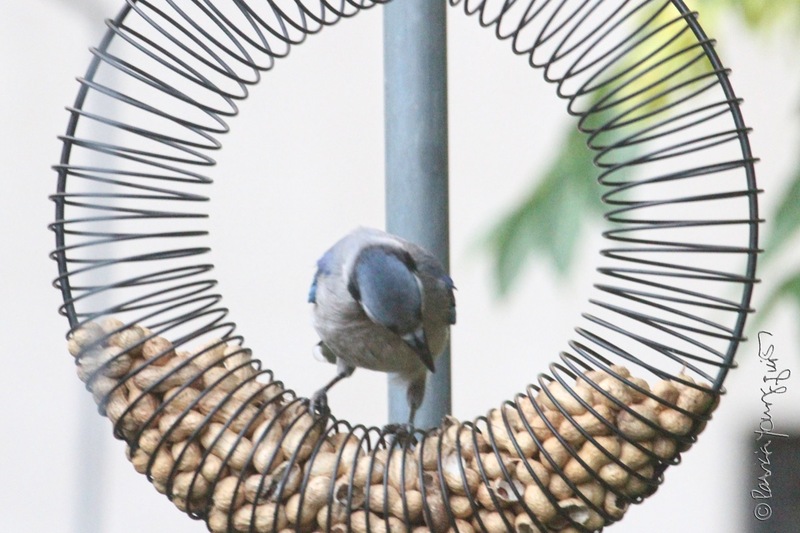 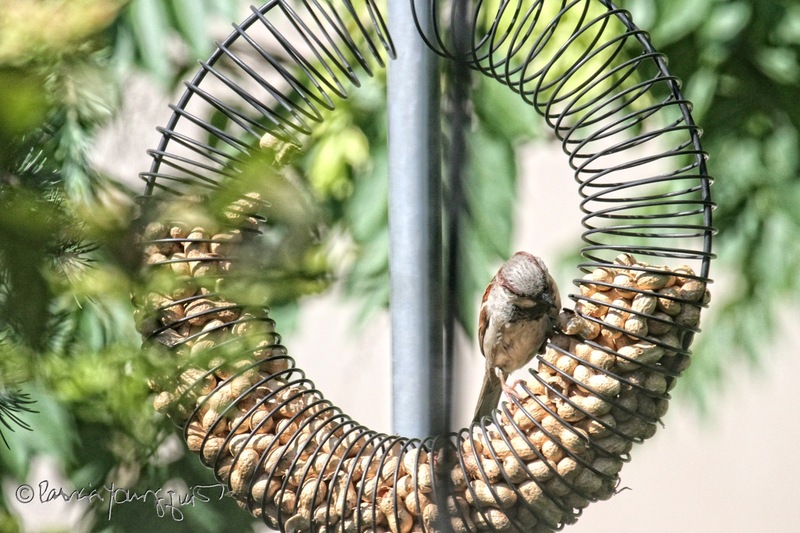 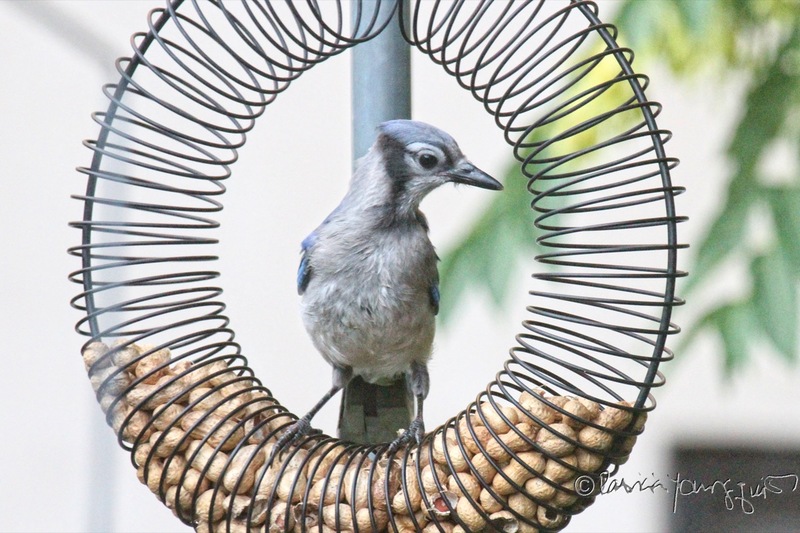 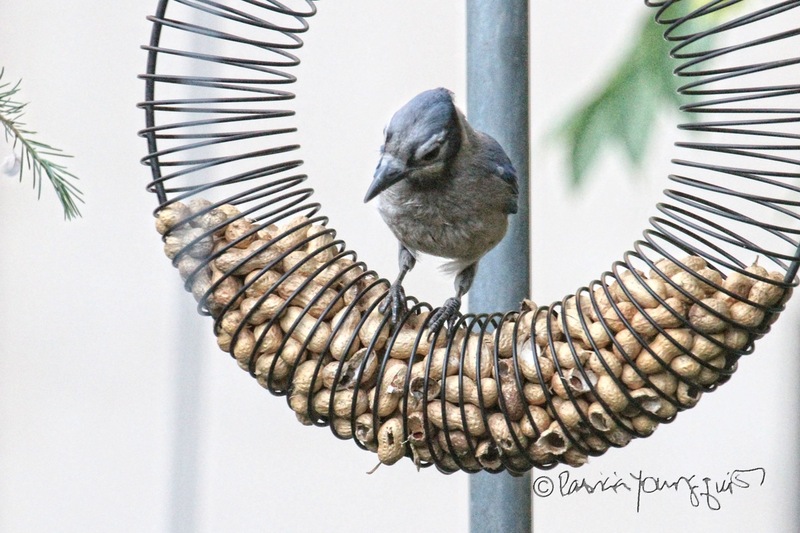 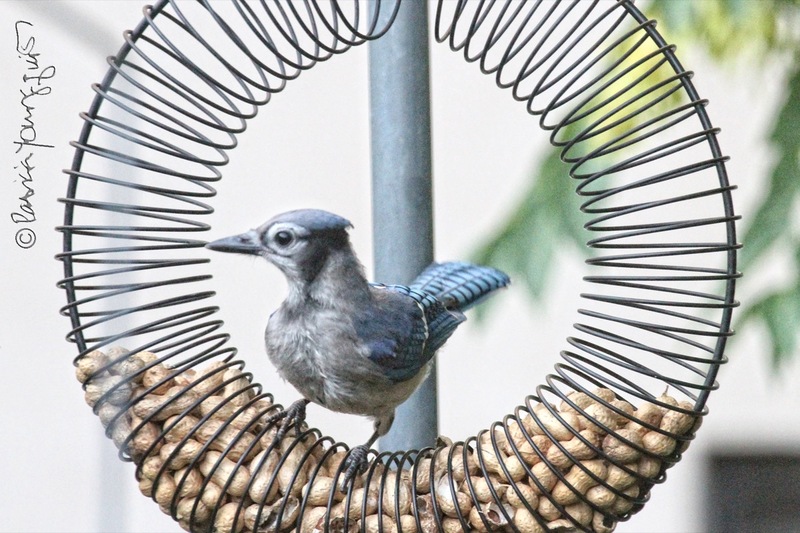 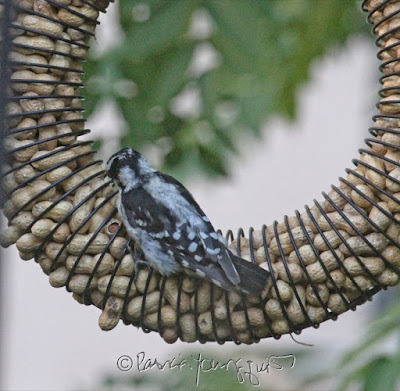 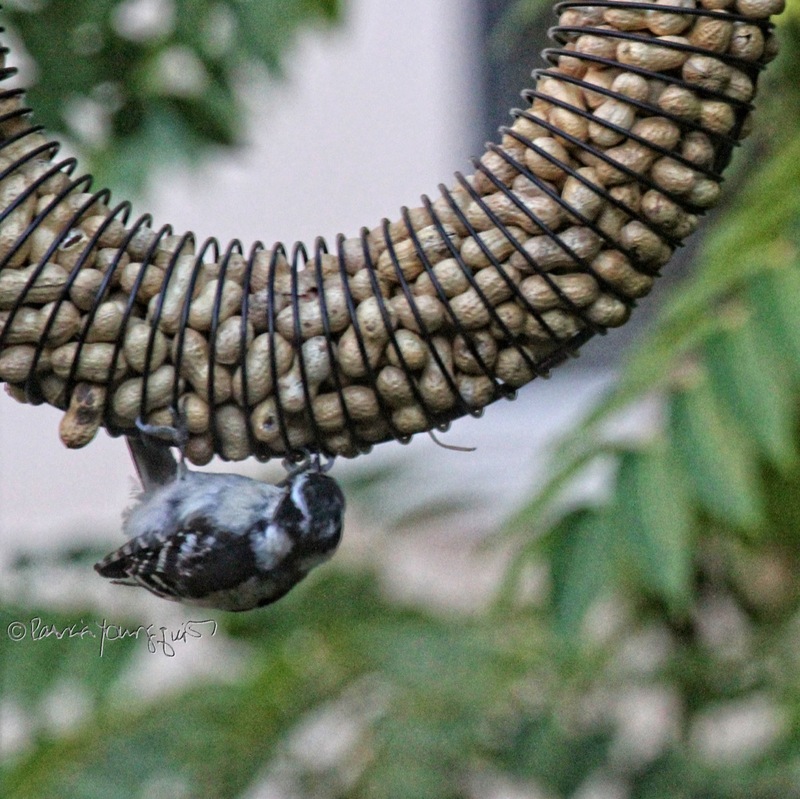 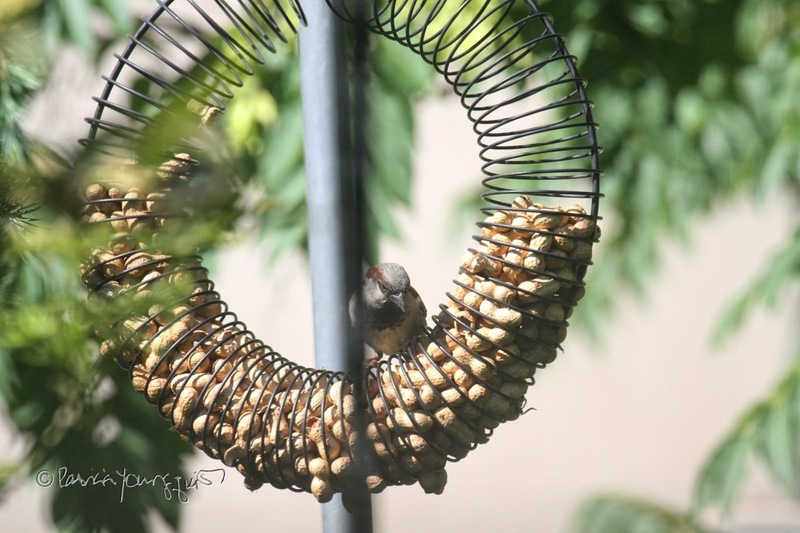 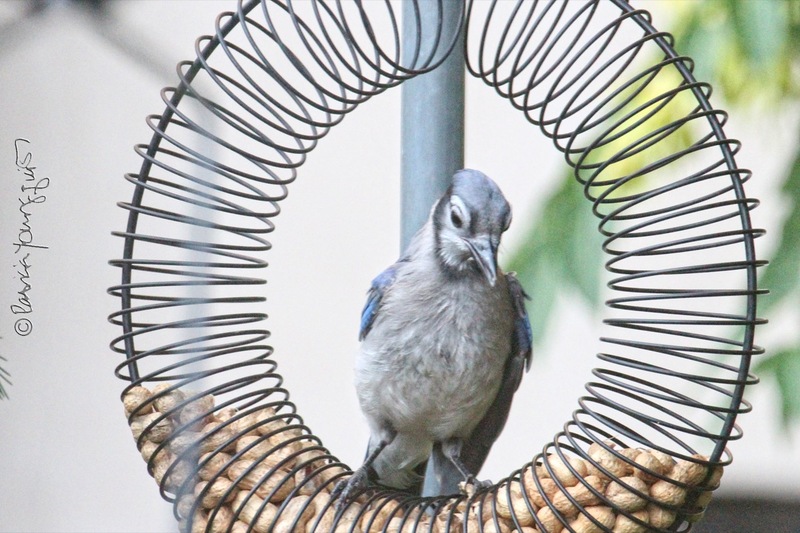 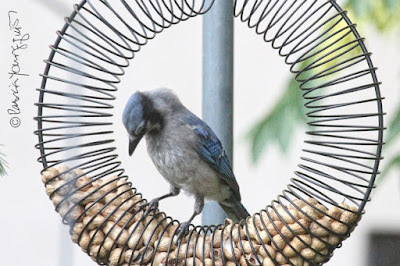 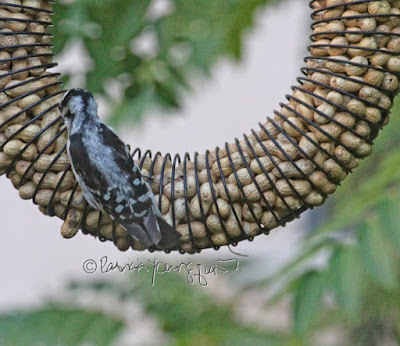 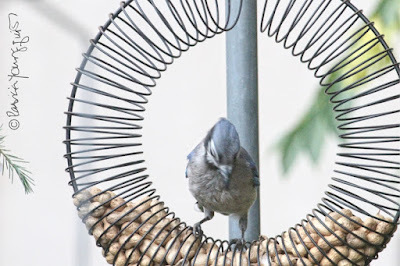 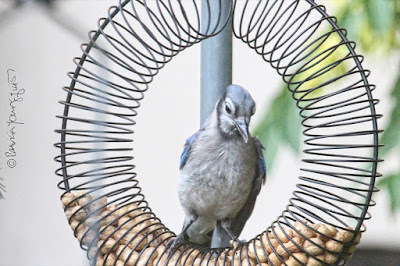 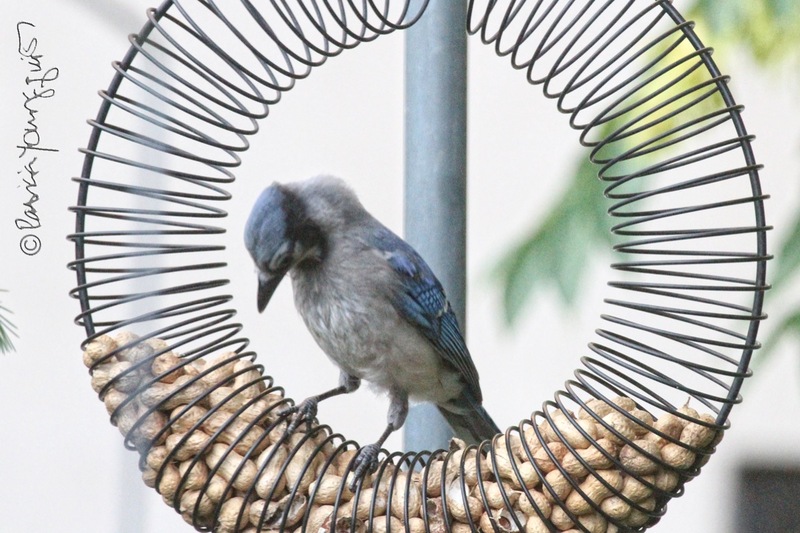 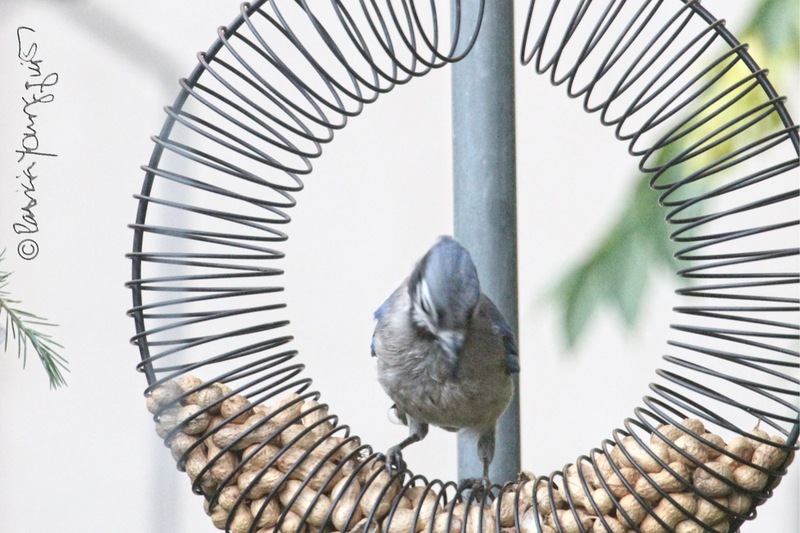 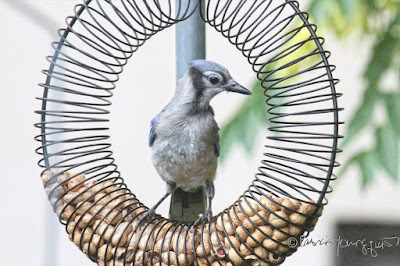 I suspect this bird type observes other birds eating from the wreath-style feeder and want to get in on the action, even though it is much easier for them to eat black-oil sunflower seeds from my house style feeder that contains their favorite seeds (as seen below). 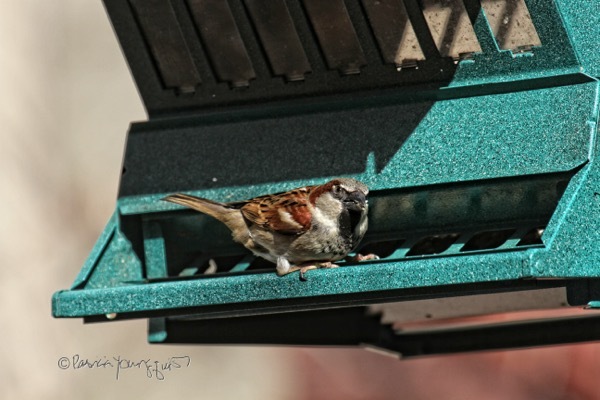 But maybe house sparrows are like some people, I'm not naming names, in that they like to have what they see others having! For surely it is much easier for a sparrow to eat something other than a peanut in the shell! However, it was a sparrow attempting to asses the possible ins and outs of getting some peanut crumbs that kept me watching from my rear window. Take a look (the photos have very subtle differences in order for you to see the time and attentiveness this sparrow put into procuring his food choice). 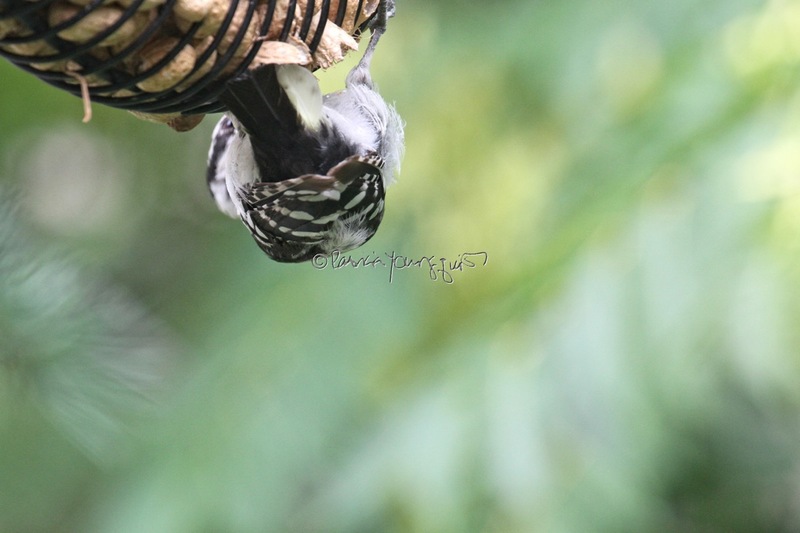 Downy Woodpeckers use their agility to access their "taste treat." 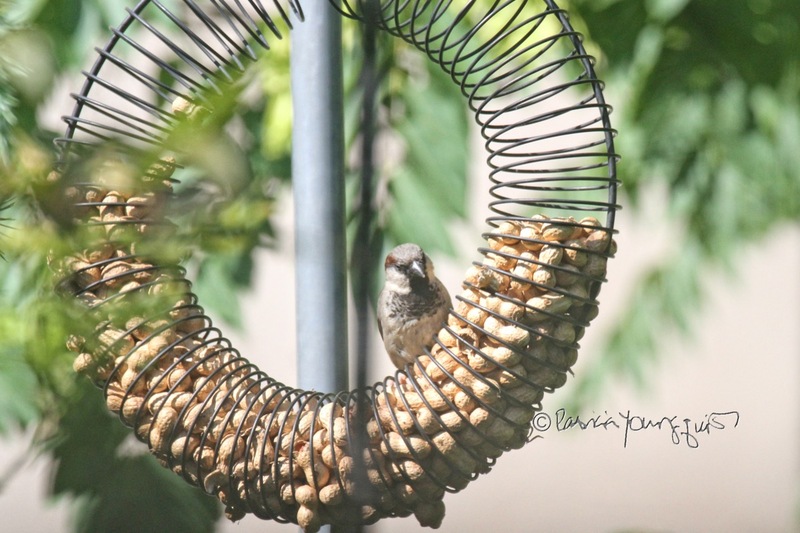 Be that as it may, the bird who kept me at my rear window the longest was a young (maybe even a fledging?) blue jay whose discovery of the peanuts and the logistics of getting his own food was a poignant sight as evidenced in the next series of photographs. 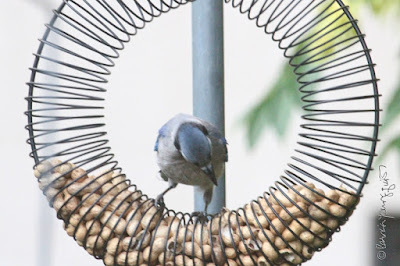 And, I'll leave it there dear reader, as it's time for me to replenish the peanuts and go back to my rear window!